Stepping into the air service by operating fights in remote areas of Nepal through STOL aircraft, Goma Air has made its name in a short period of time. Being the first airline company to operate a brand new STOL aircraft in more than four decade, Goma Air takes privilege in providing air service to Nepalese living in remote districts with utmost comfort and care. 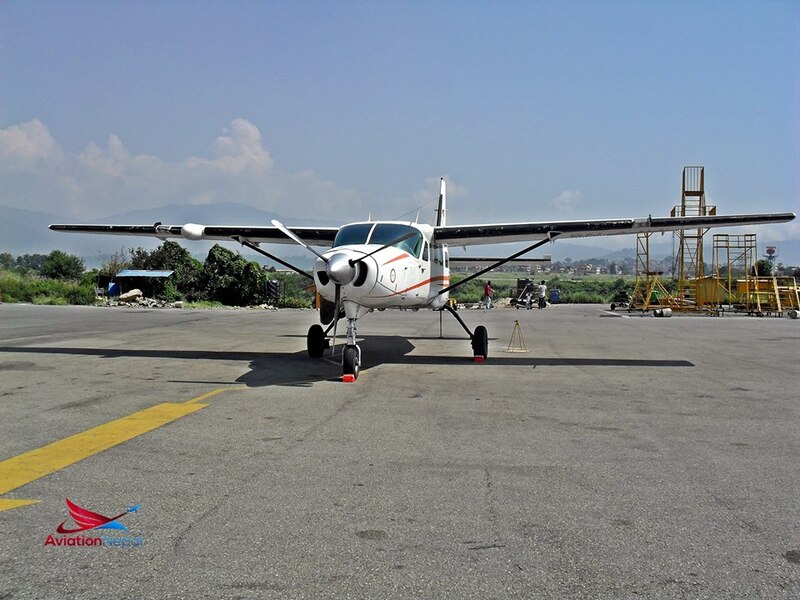 Entering into its service from February 24, 2011 with two of its Cessna Grand Caravan, it focused its operation in STOL airfields of Nepal with its base in Kathmandu and later with its brand new aircraft L-410 UVPE-20 and two Cessna Grand Caravan base at Surkhet and Nepalgunj. Goma Air is the solo airline company whose hub is Nepalgunj. Currently, Goma Air has two Cessna Grand Caravan registered as 9N-AJT and 9N-AJU as well as two LET410 UVP-E20 registered as 9N-AKY and 9N-AKZ on its fleet. Within the short extent of three years, Goma Air introduced brand new LET 410 UVPE-20 (18 passenger seat) aircraft and stretched its operation to all the STOL Airfield of Nepal. Goma Air has been bestowed NCAR 145 certification and is in course to obtain part of organization from CAAN. It provides services to mid-western cities of Nepal including Surkhet, Neplagunj as well as Lukla, Phalpu, Rumjatar, Tumlingtar, Pokhara from Kathmandu, towards Jomsom, Manang from Pokhara and Simikot, Jumla , Dolpa and Bajura from Nepalgunj and Surkhet. L410 UVP-E20 aircraft is an all- metal, high wing commuter aircraft intended for transport of up to 19 passengers or cargo or for special missions. The aircraft is powered by two turboprop engineers GEH80-200 and is equipped with digital avionics. L 410 UVP-E20 is the latest and most advanced successor of the famous L 410 aircraft series. With its robust undercarriage, the aircraft can operate almost anywhere needing just a few hundred meters of airstrip with a minimum strength of 60kg/sq.cm (85psi), i.e. it can land and take off also from rain- soaked grass or short airfields with slush. The Cessna 208B Grand Caravan is all metal, high wings, single-engine aircraft powered by a Pratt & Whitney Canada PT6A-114A engine. This engine drives a constant speed, fully feathering, reversible propeller. The aircraft has fixed gear, extendable flaps and manually adjustable trim tabs on the primary controls for the roll and pitch axis and full rudder trim for the yaw axes. The aircraft is equipped with full de-icing equipment and sufficient avionics for instrument flying including a flight control system and weather radar. Supplementary fuel can be added for transoceanic flight. The Caravan is certified for IFR flights in known icing conditions. On June 2, 2015, while returning back to Pokhara from Jomsom, the Goma air 9N-AKY fortunately saved from big accident while landing at Pokhara airport. As per our source, incident cause was nose wheel but not yet technically being confirmed. 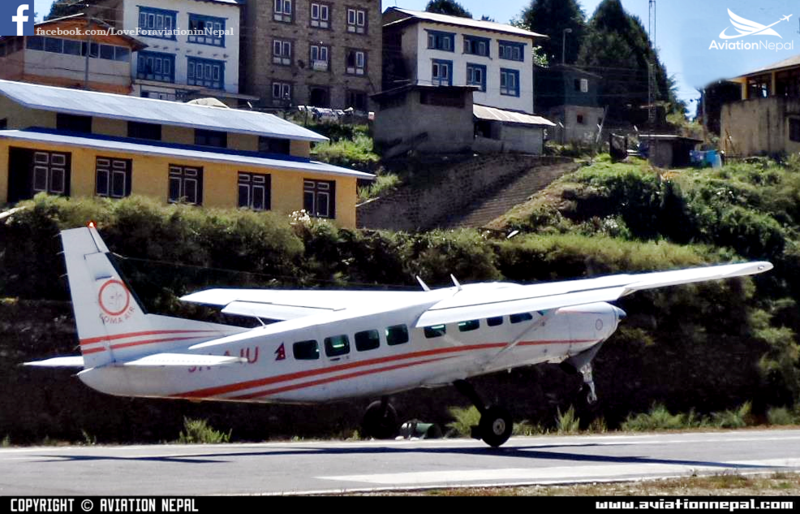 On March 2, 2016, Goma Air 9N-AKZ LET410 UVP E20 had bird strike while taking off for Lukla Airport from Tribhuvan International Airport at 8:45 am. As soon as bird hit the propeller, aircraft was immediately diverted back to TIA for emergency landing. According to Goma Air, minor damage has been caused to the aircraft. Aircraft has been grounded for certain tests. Goma Air is soon going to operate two of its new factory made Czech Republic LET-410 NG series aircraft on its fleet. Goma air being inspected by Authorities(CAAN) at Simikot Airport.